Scott Evan Davis is a composer and lyricist who won the 2012 Broadway World Best Song Award for “If We Say Goodbye.” Currently living in New York City, the former AMDA student has written the award-winning musical Powerful Day for children with autism, and a revue of his songs titled Picture Perfect that recently made its West Coast debut at the Catalina Jazz Club in LA. Scott has also produced and toured with a critically acclaimed album of his songs Cautiously Optimistic, featuring such luminaries as Liz Callaway, Faith Prince, Jason Graae and Lisa Howard, among others singing his music. Artists such as Rebecca Luker, Alison Fraser have also sung his work. He is currently working with book writer Christy Hall on a musical called Indigo about an autistic child. Last year the Huffington Post named him one of the top five emerging composers to know and hear and Broadway World recently said, “In a period of two years on the New York scene, Davis's music has become lauded and sought after internationally." We asked Scott to tell about how he got to this place in his career. This is Scott’s story. 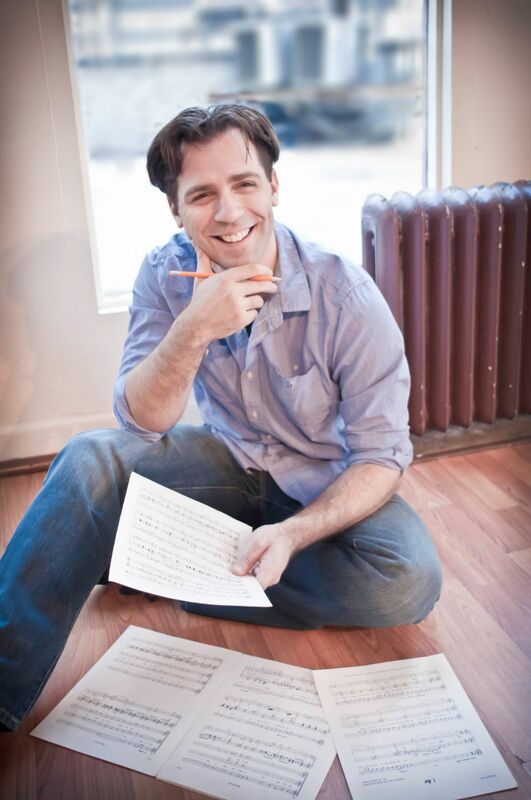 Scott Evan Davis: On my website, the very first line of bio says, “I never thought I would be a composer.” Even typing it out sounds weird, considering that is exactly what I have become. If you had asked me four years ago what I would be doing with my life, I would have thought you were crazy if you suggested songwriting. I grew up in central New Jersey, near Great Adventure in a town called Jackson. Ever since I was a little boy, I had dreams of being on Broadway. In my junior year of High School I moved in with my mother who lived a few towns over in Freehold. I attended a performing arts high school where I really came into my own. When I was 12, I remember taking a one-day workshop in music at my school. It was that day that I was introduced to piano. I fell madly in love with it. I became obsessed with teaching myself how to play, and how to read music. I took a few piano lessons, but I learned that I am autodidactic, which means I learn best when I teach myself something, rather than a formal setting. My focus was on singing and acting, and I used my piano skills to be able to accompany myself while I sang every show tune under the sun. I never had any interest in writing, or coming up with my own songs. I was perfectly fine playing what other people had written. I went to college for the two years at EmersonCollege in Boston, where I majored in musical theatre. After two years, I transferred to AMDA in NYC. I had no idea the course of my life would change because of that decision. How could I have? I knew friends who were going to AMDA, and that is how I found out about it. I thought the conservatory aspect was going to be perfect for me. I wanted much more intense training than a liberal arts program. So, I submitted, auditioned, and got in. I was ecstatic. Once I arrived in New York, the first order of business was to get a job so that I could afford to live in New York while I went to school. I ended up becoming a waiter at the Olive Garden in Times Square. It was an insane job, but I pushed through, and did the best I could. My most influential teacher at AMDA was Brian Aschinger. I immediately connected with him. He was a genius and one of the most brilliant musical theatre teachers that had ever lived. He believed in me. I could sense that. He pushed me hard during class, and I loved every minute of it. He truly mentored me and I utilized his encyclopedic brain for musical theatre as much as I could. During this time Brian was sick with cancer. Sometimes he was off from school for weeks at a time. During that time I would go to the hospital and sit with him while he broke down songs with me so that my training wouldn’t be interrupted. That is who he was. A year after I had left New York for Boston, I found out Brian had passed away. I had left on less than good terms without thanking the person who had been so influential. I couldn’t believe it. I guess I never truly believed that he would die. However, it gave me the push I needed to quit my job and start auditioning again. In a short time I got my equity card, and worked as an actor non-stop. That brought me back to New York in an Off Broadway play, called Joy. During that run, which was years later, I had a dream. In the dream, Brian was sitting on a park bench, looking young, with all of his hair, which he had lost during chemo, and his arms were outstretched. He hugged me as if he was forgiving me. The strange thing was that he was also humming. He was repeatedly humming just a bar of music, but it was so dissonant and beautiful. The next day, I had virtually forgotten about the dream until I was getting out of a cab, and it hit me. I remember standing on the corner of the street in midtown and it all came flooding back to me, including the melody. I rushed home and went to the piano. That became my first song, “Cautiously Optimistic.” The opening bars are what he was humming in my dream. Since then, I haven’t been able to think about doing anything else. For some time after that, I just wrote whatever I heard. Three years ago, shortly after I met my partner, he convinced me to do a night of my music. That is how I became a composer. It is a strange story, but I like to think that Brian’s presence in my life is always there. He changed my life. In the past three years, I have done 18 concerts, including New York, New Jersey, Alabama, London, and Dublin. After all of those concerts, I decided to create Picture Perfect, which is a staged revue of my songs. I just came back from LA, and will be bringing it to London and Australia hopefully this year. I also work with a group of autistic children on the Lower East Side of Manhattan to write an original musical with them. It has been the most fulfilling job I’ve ever had. Last year, the musical we created won the Courage In Theatre Award through MTI (Musical Theatre International.) In addition, I work during the year as resident composer for the Brooklyn Children’s Theatre, in New York. As a composer/lyricist, my influences range from Sondheim to John Bucchino and everything in between. I have been lucky enough to have a correspondence with Stephen Sondheim because he was brought to see one of the final rehearsals of Powerful Day (the musical for children with Autism.) He listened to my album and graciously wrote to tell me he enjoyed it very much. After that letter, I can die a happy man. My life has had a lot of twists and turns. Now that I am turning 36 in a month, I am happy with where I am, but I also can’t wait to see where life takes me. All I know is that I need to write. I need to tell stories and speak through characters. It is when I feel truly happy. I can only hope that one day I will be known as a successful writer.